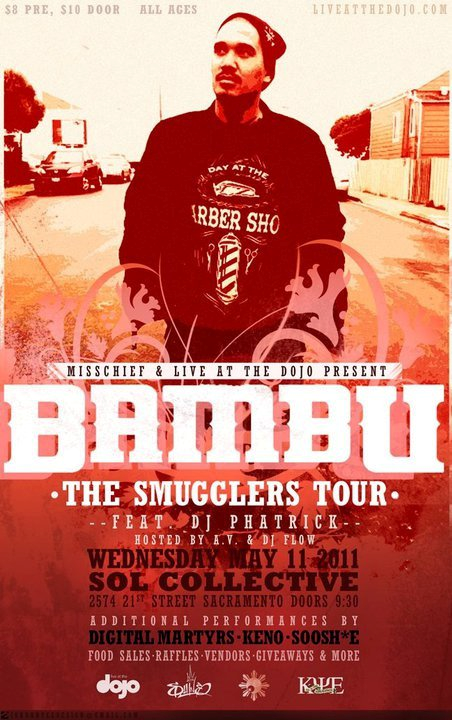 Wednesday, May 11, 2011 – MissChief916 and Live at the Dojo presents The Smuggler’s Tour at Sol Collective, located at 2574 21st st. in Sacramento. Show starts at 9:30 pm and will be hosted by A.V. and DJ Flow. Featured turntablist DJ Phatrick will be mixing it up on the ones and twos. SledgeHammerGraffix will be in the building with your favorite t-shirts for sale. Special $10, $15 and $20 t-shirts. For those who partake in the festivities, there will be food, t-shirt vendors, raffles and give aways. SHGraffix will be giving away a t-shirt as a raffle prize. Special performances by Digital Martyrs, Keno and Soosh*e.